JNN 27 Jan 2014 Karachi : The New Year started with a lot of Hopes that with the Changed Leadership of Pakistan Army as it may waken up and do their Job of Defending the Nation against the Threats within the Country , and a Long Over Due action against the Takfiri Terrorists which are now a threat not only to the Shia community but for all the Peace loving Citizens of the World . And Most of all for the Nation itself, as they are openly challenging the Integrity of Pakistan. But The Majority of Politician of the Country who have sold their Souls to the enemies of Pakistan , and are still defending the terrorist and trying to buy as much time as they can so they can damage the Nation , till the limit that it is irreparable and History could repeat , its Bitter Past of 1970. As now it is a well established fact that these Takfiri ( Calling their Opponents Infidels , who according to their wahabi Ideology are liable to be Killed, which is against the teaching of Islam ) Terrorist are actually a mob of Saudi Sponsored Mercenaries , who Kill any body and every body to Perpetuate the Saudi Kingdom , as now Saudi Monarchy is well afraid of their fall , so now they have invested Billions of Looted Wealth of Arabia , the Holly Land , in the Nurturing the Terrorist Nurseries around the World , and Especially in Pakistan as they think that some day they can even steal the Nuclear Weapons of Pakistan and Over night can become a Nuclear Power. So in the same tradition these Terrorist Outfits of Pakistan which are working under the Banners of Sipah e Sahaba Pakistan, Tehrik e Taliban Pakistan, Lashkar e Jhangvi , Jundullah , Jaish e Islam , Jaish e Muhammad and other Terrorist Outfits , and Banned Organisation and cells are busy Killing the Members of Shia Community . 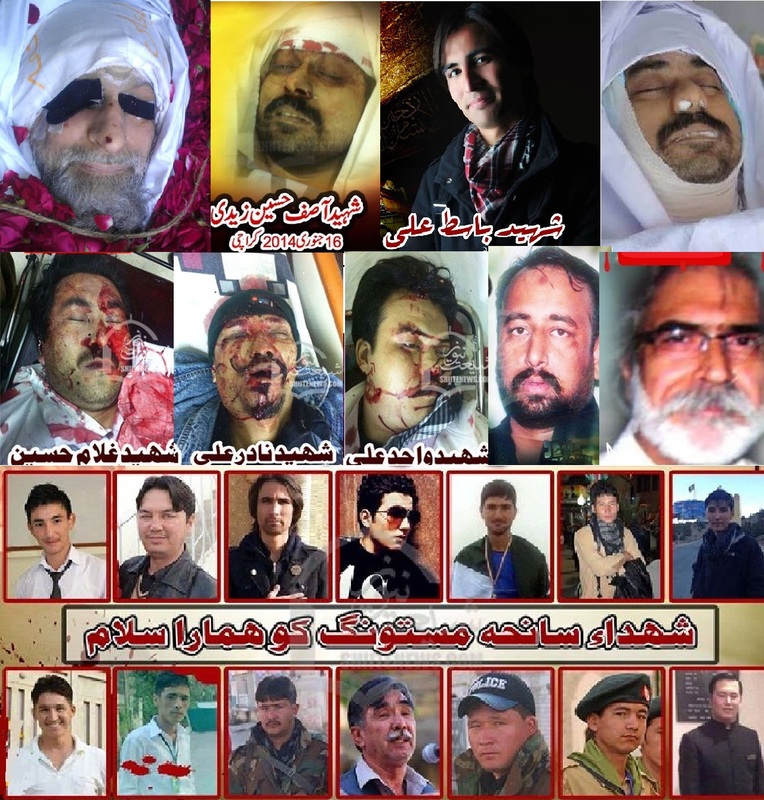 While in the First Month of the Year 2014 , these terrorist have Martyred atleast 47 Patriotic Shia National of the Pakistan , who are defenseless in the absence of the Security and Support , they should be given by the State and the LEAs . And on the other hand they are not even allowed to defend themselves by getting armed to counter the terrorist threat and onslaught against them. On 27 Jan Renowned Shia Dr.Ghulam Mustafa one of the trustees of Ali Akbar trust, Khanpur (Rahimyar Khan district) was shot and Martyred when he was going home on a motor cycle after closing his medical centre. DPO Rahimyar Khan Suhail Zafar Chattha said that unidentified motor cyclists targeted him on way to home along with his friend Kifayatullah. He sustained serious injuries and he was taken to hospital but could not survive. However his friend escaped unhurt. His son Farhan Mustafa told mediamen that his father was receiving threat calls from unidentified persons while he had no enmity in the area. A Large No. of Shia activists staged a demonstration in Khanpur and alleged that Government failed to protect the life and property of Shia Community . On 24 Jan The Ambulance Driver of Jafria Disaster Cell carrying the wounded came under heavy firing of the terrorists. M. Ali s/o Afzal Ali, was hit with bullets, Which He could not survive, and embraced Martrdom on the spot . On 22 Jan Qalbe Abbas 17, was targeted and attacked on Tuesday near Imambargah Kazmain by the Sipah e Sahaba Pakistan Terrorist , due to which he was critically wounded , and was shifted to the Hospital , but due to the Fatal Bullet wounds , he succumbed to his injuries and embraced Martyrdom at the Hospital , during the course of his treatment. His Funeral prayers was held at Imam Bargah Shah-e-Karbala, Rizvia Society on Wednesday. On 21 Jan A Bus Carrying Shia Pilgrims returning after their Pilgrimage from Mashad , Iran was attacked by a suicide Bomber at Mastung near Quetta resulting in the Martyrdom of 28 Shia Men, Women and Children , which was even claimed by the Terrorist Organisation Lashkar e Jhangvi . While the Enraged Shia Community , but at the same time Peaceful Shia Community staged a Peaceful Protest Sit In across Pakistan ,in a Number of Cities of Pakistan , and in some cities on Number of Places , like in Karachi Protest Sit Ins were arranged at about 15 Different Places with thousands of sympathizers and Mourners of the Tragic Incidents occurring on daily basis . These Protest Sit Ins were finally Called off Peace fully , after the assurance of the Interior Minister Ch. Nisar and the Chief Minister of Balochistan that a result Oriented Crack Down will done against the Terrorist and the Criminals , and the Perpetrators of these Heinous Crimes will be Brought to the Book , and that the Justice will be done . On 21 Jan , A Dedicated to the cause Low Profile , and well reputed Shia Cleric Maulana Alam Moosvi , was targeted and attacked by the Lashkar e Jhangvi Terrorist on Monday in the Provincial Capital of Khyber Pukhtoonwa , Peshawar. He was the Custodian of Imam Bargah Syed Alam Murshidi in the Khudad Area , Near Qissa Khwani Bazar , Peshawar. His father was even a Well known Cleric. And was even endorsed by the Late Ayatollah Khomeni. While Alam Moosvi was a close aid of Allama Arif Hussain Al Hussaini . According to the details , He was on his way to the Mosque , when the Terrorist intercepted him in the famous Qissa Khwani Bazaar , Peshawar , and attacked him. “Two gunmen came walking and opened fire on the scholar and escaped in the narrow streets when he came out of his house and walked towards the mosque,” local police official Fazal Jan said. Al- Musavi was a respected scholar and used to deliver sermons at special Shia gatherings, he added. He was also the Brother of a Senior Journalist Baqar Moosvi . It should also be noted that KPK is the Most effected Province of Pakistan and Hundred of Shia Men and Security Personnel have already lost their lives , in the Ongoing terrorism by the Tehrik e Taliban Pakistan Terrorists , as it is on the Border the Northern Tribal Area of Pakistan , know as FATA ,which is has become the Nursery of the Terrorist and the Home to all the Criminals and Enemies of the State. Pakistan Tehrik e Insaaf has come up in the Last Elections ,with a Manifesto of Peace and Tranquility on the First Priority in the Province, while instead of taking Punitive action against the terrorist , Just Ignoring the Infested Terrorism ,and repeatedly trying to accommodate the terrorists , by asking to Negotiate with the Murderers of the Sons of the Soil , and the Traitors of the Nation. On 19 Jan Shabbir Shah and his driver Khadim Hussain were Martyred in the city of Gujrat on Tuesday as he was heading to work at the University of Gujrat, Punjab. According to the details , in the early hours of the Day ,as Shabbir Shah was heading towards his office at the Campus, when he reached Jalalpur Road, two terrorist of Sipah e Sahaba Pakistan came on a Bike ,and intercepted his car and Sprayed a volley of bullets targeting Shabbir Shah & His Driver , due to which Both were fatally injured and embraced Martyrdom on the Spot . He was the Director of Student Affairs at the University of Gujrat .And was Active in University affairs and was a Progressive Official , He was receiving Threats from the Terrorists , As told by Sh. Abdul Rashid Spokesman for the University. On Jan Assistant Sub Inspector ( ASI) , of Sindh Police , S. Kamran Hussain Naqvi , 45 , was attacked by the terrorist of TTP in the Chakra Goth area of Korangi , which resulted in the Martyrdom of the Brave Police Official. While later his body was shifted to the Hussaini Imambargah , Korangi No. 5 ½ for his funeral Prayers . It should be noted that Kamran was the Lone Brother of 5 Sisters , while at the same time he was the father of 5 Daughters and a Son. On 19 Jan A Shia resident of Gulbahar area , Zaigham Abbas , 27, was attacked by the terrorist of Sipah e Sahaba Pakistan near Jafria Imambargah late Friday night. He was critically injured due to the Bullet wounds , and was later shifted to Abbasi Shaheed Hospital , but he could not succumb to his Injuries and embraced Martyrdom on Saturday Morning. He was a Hard Worker and owned a Tyre Puncture Shop in the same area of his residence. He was shot by the terrorist of SSP / TTP who came on a Bike and shot him 3 Bullets in his Chest , while he was busy working at his shop . His Body was later shifted to the Imambargah Shuhuda e Karbala , Sadaat Colony, F.B.Area, where his Funeral Prayer was offered. Taimuria SHO Ejaz Lodhi said Dr Asif Hussain Zaidi arrived in a car at his clinic in Sector 15-A-1 of Buffer Zone and was walking towards his clinic after parking the car when two armed pillion-riders, who were already waiting for him there, fired at him and fled. The wounded doctor was taken to the Abbasi Shaheed Hospital where doctors pronounced him dead on arrival. On 16 Jan Shia Charted Accountant was target killed,Earlier, Ali Hussain Qazilbash, 40 a Charted Accountant by Profession was ambushed and Martyred by the Terrorist of Tehrik e Taliban Pakistan at a traffic signal near Firdous Market in Gulberg area of Lahore on Wednesday night. Qazilbash was on his way home when unidentified motorcyclists ambushed his Honda-civic car at a traffic signal near the Firdous Market. They shot two bullets and Qazilbash died on-the-spot. The killers fled away from the crime scene. Model Town SP (Operations) Tariq Aziz said the victim, who worked with Syed Engineers, left his Faisal Town office shortly before the shooting. On 12 Jan the Brave Son of the Shia Community Aitazaz Hussain Bangash was in his routine gone to school but as he was out of the school with a friend , who suspected a suicide Bomber coming towards the School , which at the time was full of his fellow Pupil in the School as the assembly was in process , instead of running away from the Bomber , grabbed him and didn’t let him get away , and carry out his nefarious desire of detonating himself in the School assembly , which may have resulted in Hundred of Deaths of Young Innocent Children and School Staff, But to save the fellow Students Aitzaz sacrificed his life , and embraced Martyrdom as the suicide Bomber detonated himself in his Strong Hold , as he could not get away from him. 08 Jan Once again the Terrorist of Tehrik e Taliban Pakistan shot martyred a Shia banker Waqar ul Hassan s/o Sardar Hussain in busy shopping area of Peshawar, capital of Khyber-Pukhtoonkhwa Province on Tuesday. According to the details Waqar was intercepted and attacked in the Sarafa Bazar ( Jewellery Market ) of Peshawar , and fired several Bullets at him , due to which he embraced Martyrdom Instantly , while the terrorist fled away from the Busy Market Un intercepted . Waqar was the resident of Gulbahar No.2 Peshawar ,and his funeral Prayer was also Performed at his residence. He was an officer of Habib Bank (HBL). His targeted murder sparked off an instantaneous reaction from the students of his college who came to streets and Protested against the Killing , and raised slogans against the terrorists who assassinated their teacher and against the Provincial Government which has miserably failed to Provide security to the Citizens of Punjab , and especially the Shia Community. And Demanded a Military Operation against the Terrorist and their Hide Outs in the North Waziristan. 06 Jan Another Shia Dr.Azhar Hussain was targeted in Rajanpur area of Punjab province. According to the details Dr. Azhar was on his way back from his Raza Surgical Centre to his residence , when the terrorists ambushed him in Rajanpur. The news of the targeted murder spread like jungle fire. Shiites came out of their houses and gathered on main road. They Also Staged a Protest Sit IN against the murder. On 04 Jan At least three Shia Men were ambushed in Gulshan-e-Iqbal ,Karachi in the early hours on Saturday. According to the details Ghulam Hussain, Nadir Ali and Wahid Ali accompanied by two other friends were in their Suzuki Hi Roof vehicle near Agha Haider Juice Centre at Maskan Chowrangi Gulshan-e-Iqbal. When the Terrorist of Sipah e Sahaba Pakistan sprayed Bullets on their car resulting in critical injuries to all the occupants of the Car . All the five Men were rushed to nearby private hospital where doctors declared three of them dead. Two injured were treated. On 03 Jan The Terrorist of Sipah e Sahaba Pakistan attacked S.Azhar Hussain Zaidi s/o S.Ansar Hussain Zaidi , while he was on a visit to Khairpur , Sindh ,on Thursday night. He was attacked in the Gudu Chap area of Khairpur , while he was distributing the pamphlets of the Chehlum of the Leader of MWM Allama Deedar Jalbani to be held in Karachi , who was also Martyred by the Terrorist of SSP in Karachi. Due to the firing of the Terrorist He embraced Martyrdom on the spot . Later His Body was shifted to Karachi for his Funeral and Burial . He was an Active Member of Majlis-e-Wahdat-e-Muslimeen . His Funeral Prayers was held at Imambargah Shuhuda e Karbala , Sadaat Colony, F.B.Area. Karachi. This entry was posted in Asia Pacific, Pakistan News and tagged 2014, Aitazaz Hussain Bangash, Ali Hussain Qazilbash, Changed Leadership of Pakistan Army, Dr Asif Hussain Zaidi, Dr.Azhar Hussain, Dr.Ghulam Mustafa, Ghulam Hussain, Jan Shabbir Shah, Karachi, Khadim Hussain, LeJ, M. Ali s/o Afzal Ali, Martyr, Maulana Alam Moosvi, Maulana Nazir Umrani, nadir ali, pakistan, Peshawar, Qalbe Abbas, Qisa Khwani Bazar, Rahim Yar Khan, S. Kamran Hussain Naqvi, Shabbir Shah, shaheed, shia, Shia Cleric Maulana Alam Moosvi, shia community, Shuhuda, Sipah-e-Sahaba Pakistan, SSP, Tehrik e Taliban Pakistan, TTP, Wahid Ali, Waqar ul Hassan s/o Sardar Hussain, Zaigham Abbas, Zubeda Nasirah. Bookmark the permalink.